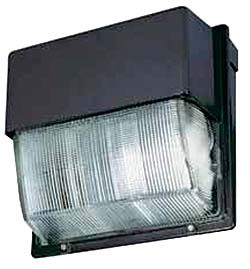 Die-cast wall pack has an aluminum housing and corrosion-resistant external hardware. Reflector is made of specular anodized aluminum and the refractor is prismatic borosilicate glass. Lens is sealed and gasketed to help prevent the entrance of outside contaminants. Socket is a horizontally oriented mogul-base for 175 watts or more; medium base for 150 watts or less. Standard finish is dark bronze polyester powder finish. Additional architectural colors are available. UL listed for 25 degrees C ambient and wet locations. Available in compact fluorescent, induction, high- and low-pressure sodium, and metal halide models.